A quiet green lane near Roydon Manor, just waiting to be walked! 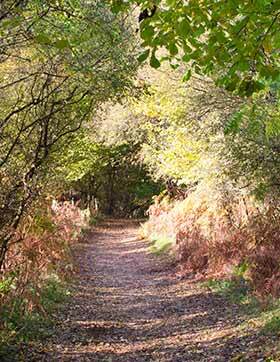 Check out these great Brockenhurst walks. All can be started from Brockenhurst village centre and they are therefore convenient for travellers by train to Brockenhurst station and also for users of local bus services including, in season, New Forest Tour buses. All these Brockenhurst walks, though, also pass close to Forestry Commission or other car parks situated on, or near, the main walk routes, which provide convenient alternative start points. The Brockenhurst walks are of varying length, ranging from 4.5 kilometres (2¾ miles) to 10 kilometres (6¼ miles), excluding the distance from the village centre to the main start points. There are no really steep gradients, and few stiles to climb over. And for the really energetic, the first walk shown can be extended to incorporate much of a separate Boldre Walk, providing a total route length of 14 kilometres (8¾ miles). Please note: Charges apply to use of the car park in Brockenhurst village centre. Free parking is, however, available in Forestry Commission car parks and in a small car park beside the river, opposite the Balmer Lawn Hotel - adjacent to the A337 to the north of the village. Enjoy a walk past Brockenhurst's historic parish church, Brockenhurst Park and Roydon Manor; through ancient woodland and beside the Lymington River. This walk shares the same early route as that above, but in Roydon Woods Nature Reserve, turns right to cross Setley Plain; passes beside Castleman's Corkscrew - a disused railway line; and returns via Hincheslea Bog and South Weirs. Explore North Weirs and South Weirs; pass the site of Brockenhurst's Victorian Rifle Range and the Saxon manor at Hincheslea; stroll through ancient woodland, and across New Forest heathlands. Walk beside Balmer Lawn and the 19th century site of the Victoria Brick and Tile Works, before enjoying a walk through mature broad-leaved and coniferous woodland.